Festivals are meant to bring back the joy in life, a relief from daily rigmarole. They are an occasion to celebrate and be alive, providing us necessary escape from the daily grind. And if you bring a little element of togetherness then it probably is the best concoction of happiness. This Diwali our days were unexpectedly busy on all accounts. Coupled with family being unwell, we could not prepare the traditional sweets until the very onset of the festival. We decided that it will be wise to get sweets from outside this time. It was a practical decision given that there was hardly any time or energy for anything otherwise. And thus we got house cleaned and all in anticipation of the festival. 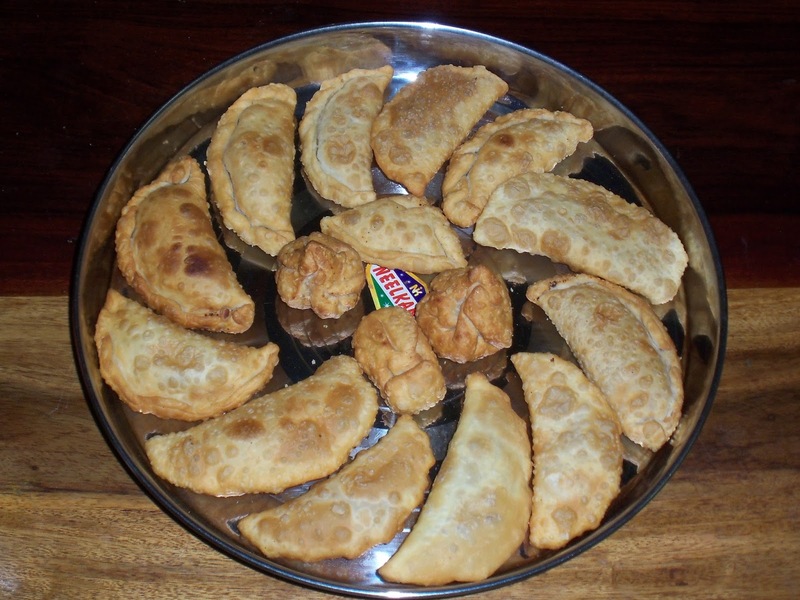 One night, few days before Diwali we were talking reliving our nostalgic memories of weighing gujiyas and what not. Suddenly we remembered my mother who had reluctantly accepted the fact that there will not home made sweets for this Diwali. I guess that was a trigger enough for us to decide that we will make few gujiyas at least if nothing else. My mom is diabetic and we decided to try Sugarfree Natura this time, for its ability to provide natural sweetness. We wanted to keep this as surprise so it was time for late night cooking in the bedroom using induction plate and utensils. We first 2 spoonfuls of ghee to maida and kneaded it till it became sticky. Then we added water and prepared the dough with kneading until it became like play-dough. Then we covered it with cotton cloth, else it would have become to dry to roll. We then set out to prepare the filling. We powdered the cardamom. Then heated the kadai and put khova in it. No need to add any oil as khova when heated becomes greasy automatically. Soon it was rolling in our non-stick kadai. We roasted it till it became brown in color. We then let it cool and mixed cardomom powder and Sugarfree natura powder and kept it aside. Now was time for rolling the wrappers for gujiya. We rolled it in small puri size and then filled with little stuffing, closed the puri, stuck the edges and used our groved pizza cutter to cut it in shape. After it was cut, each gujiya was placed under the cotton cloth to avoid drying. Once we rolled out all, it was time to fry. We heated ghee in the kadai and when it was ready, deep dried all few at a time until slight brown in color. After draining the excess ghee, gujiyas were neatly stacked in dried air tight container for the surprise next day. And yes - the next day look of our family was indeed priceless :). We really loved our joint cooking session and hope you will get inspired for yours!